I lost my diploma, Its a good thing it only cost me about 30+ thousand, of which I am still paying for. I know mentioned that in my Monday GBU. I spent ALL DAY Monday looking for it. Literally it was 10 pm when I found it. My brain was literally fried. So I snuggled up on the couch with Westley and Tiger and watched Breakfast at Tiffany's. How in the world have I gone all my life and never watched this movie? If I had know that Audrey Hepburn's name in the movie was Holly, or that her Cat looked like my Tiger I probably would have watched it sooner. After all we owe a lot to this movie. Without it we may not have the little black dress. Who doesn't own a little black dress, or recognize that Tiffany's blue from a mile away? Paul Varjak: [about Holly and Jose] So you're getting married, then? 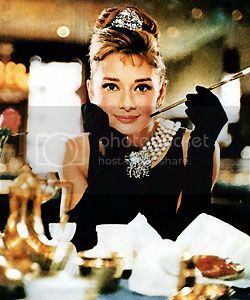 Holly Golightly: Well, he hasn't really asked me, not in so many words. Paul Varjak: Well that's how many it takes: will you marry me? [takes out the ring and throws it in Holly's lap] Here. I've been carrying this thing around for months. I don't want it anymore. Such a good movie. It is right up there with Armageddon, Sweet Home Alabama, Princess Bride, Mortal Kombat, and the Crow as my fave movies. Have to be honest, Breakfast at Tiffany's is one of those one I still haven't gotten around to watching. Need to add it to my Netflix cue! The Crow is one of your favorite movies? That's a great one! yeah the crow really is one of my faves. I remember the first time I ever saw it. I love the love story behind it. That death can't stop his love for her. The tagline Real love is forever says it all.